Update 8/13/2015 2:20PM : I have received an official response from the ComputerStick campaign. It acknowledges that the campaign video did not capture a ComputerStick in operation, but stands behind the campaign’s claims. 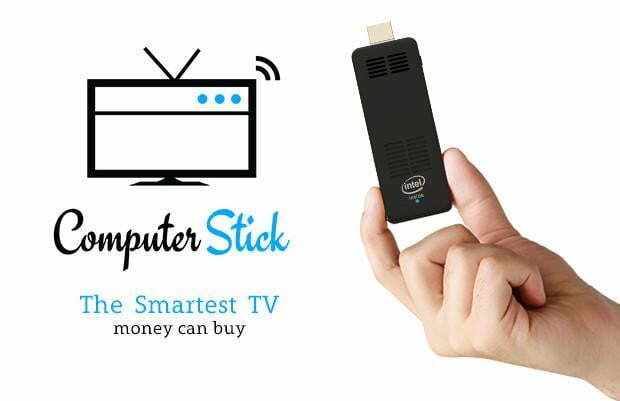 Last week a company going by the name of ComputerStick launched a IndieGoGo campaign for a miniature PC with a $30,000 flexible funding goal, which it quickly surpassed, earning $152,000 at publication. That’s not unusual, as mini PC campaigns have become popular on all crowd-funding platforms. But this particular campaign represents everything wrong with crowd-funding today. The campaign’s big, huge stinker is its video, which is outright dishonest. It shows people enjoying the ComputerStick in a variety of scenarios, including gaming. Here’s the issue; none of them actually show the ComputerStick in use. While the video repeatedly shows the device being inserted into an HDMI port, the video captured is not from the device. This is obvious by the battery life indicator, which means the video shown is from a laptop. Suspiciously, the video also appears to show Windows 7, an operating system that hasn’t shipped on a Compute Stick and which the campaign itself does not claim to use (it says the device will ship with Windows 10). But the games aren’t being played on the Computer Stick – they’re simply YouTube videos. This is obvious because both supposed gameplay clips are watermarked by the people who produced them. The mark in the Minecraft video is too small to identify, but the shooter video is from IGN. The ComputerStick’s general branding also raises an eyebrow. The campaign prominently claims its device is twice as quick as Intel’s Compute Stick, but that claim is based on the “latest Intel Cherry Trail Atom chipset” – which is not yet available in any stick PC form-factor. You might think that means this campaign is debuting the Cherry Trail in a computer stick, but that’s not the case. In fact, the “twice as quick” claim only applies to the ComputerStick Pro – which won’t be available until the end of 2015. Coincidentally, that’s when other manufacturers like Asus are slated to launch their own Cherry Trail compute stick, and by then Intel may even have Skylake-based Compute Sticks with Core processors available. If you want the ComputerStick now, you’ll end up with the current Bay Trail version, which is essentially identical to the standard Compute Stick. If there’s anything charitable that can be said about it, it’s that the price of $125 is cheaper than other outlets by a few bucks. It’s not the claimed savings of $50, though (a Compute Stick is $140 on Newegg) and backers have to pay for shipping, which is free through Amazon and Newegg. The questionable claims don’t end there. The campaign’s IndieGoGo page has an interesting table that lists the possibilities of the ComputerStick compared to others, like Roku and Apple TV. This shows that the device, unlike others, lets users surf the web and play games. The only problem with the chart is that some competitors in fact do those things. Roku can be used to play games, and the Chromecast lets users cast their desktop to the TV (albeit as an experimental feature). As you might expect, the vast majority of the ComputerStick’s backers have selected the ComputerStick Pro – that’s the version which is allegedly “twice as quick” as the current Compute Stick, and won’t be available until the end of 2015. It’s hard to say if the $175 price will or won’t be a good deal because we don’t know the price of any competing models that will be available by year’s end. If you want a Compute Stick now, you can buy from a manufacturer that currently offers it, though I recommend you read our review before you pull the trigger. I was not enamored with it.